I was in Colorado on a family vacation, but my children were in ski school and my husband was tackling deep powder in the back bowls, so I was on my own for a few runs. There was a kind of serenity to my day. Listening to my skis schuss down the mountain, I had time to appreciate the sounds around me and let my mind wander aimlessly. 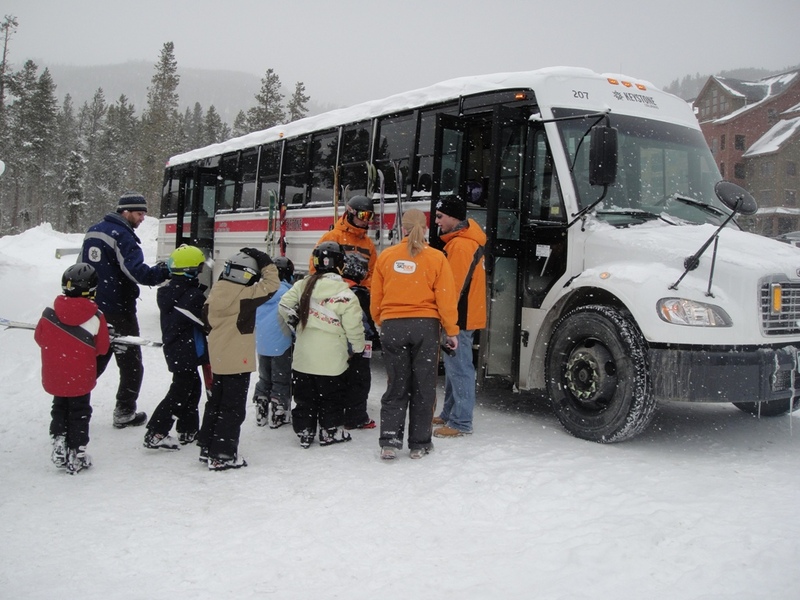 Enthusiastic children board a bus to ski school at Keystone's River Run Village. The Arapaho basin provided a variety of ways to put our bodies to the test while distracting us with immeasurable beauty. 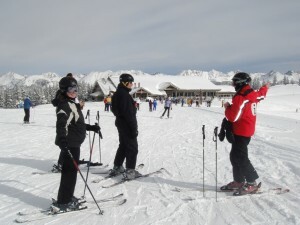 From our condo in River Run Village, my family began our day with breakfast burritos, pan au chocolat and the occasional mimosa at a local coffee shop that was only steps away from Keystone’s ski school, chairlifts and River Run gondola. The small-town feel of the village instilled a confidence in all of us that might be lost in a more daunting mega-sized resort. It was easy for my husband to find his advanced challenge on high-mountain Sno-Cat rides to windy basins while I found my bliss in long intermediate runs. At Bob’s Run I found myself faced with enormous moguls. My burning legs halfway down the run made me appreciate my Keystone ski pin that read, “Got Oxygen?” At more than a mile above sea level, I paused for air several times – the benefit of which was stillness in which to appreciate the jagged mountains that jutted out in every direction around me. A lone skier enjoys the slopes under a bluebird sky at Keystone, Colorado. After an exciting day of ski school that left my daughters bubbling over with stories of their mountain successes, my family went up the mountain to explore Kidtopia while I slipped away for mental and physical rejuvenation at the Keystone Spa. While they scrambled around a legendary snow castle and reigned over the mountain from thrones of ice, I gratefully received a fluffy robe and was told to relax. “We realized you must be running late, so we moved your appointment back a half-hour so you could unwind before your treatment,” the welcoming spa attendant told me. I snuggled into a fluffy robe and settled in a quiet meditation room where a copper cauldron filled with steaming water and rose petals was placed at my feet. By the time my massage therapist came for me, I was well on my way to total bliss. She rubbed and pulled my sore thighs and calves in a warm, softly lit room and then poured me back into a fireside chair in the meditation room where cold grapes and hot tea waited. The following day found my husband back on the mountain, but my daughters and I were excited to try out a five-acre, Zamboni-smoothed lake. We had skated on lakes in northern Wisconsin, but the threat of pits and ridges there kept us cautious. On Keystone’s smooth lake we confidently plowed through 4 inches of powdery snow that had fallen in the night. My daughters skated a big heart into the snow for me, and we plopped down in it to make angels on the rink. Surrounded by mountains filled with skiers, we lay flat on our backs and held hands. By then, the Zambonis were plowing away the snow, and we got up to zoom around the cleared areas, too. Later that day we moved from Keystone to Vail where we caught a bus to the Eagle Bahn gondola for dinner atop Vail Mountain. Vail Village’s cobblestone streets, upscale window displays and Alpine architecture felt like a movie set. I kept expecting a tuxedoed James Bond to careen through on a Ducati as we walked to the gondola. No such luck, but our gondola ride maintained the Bond-esque quality. We rose above the twinkling village into a cloud of snow that mimicked a trip through outer space. 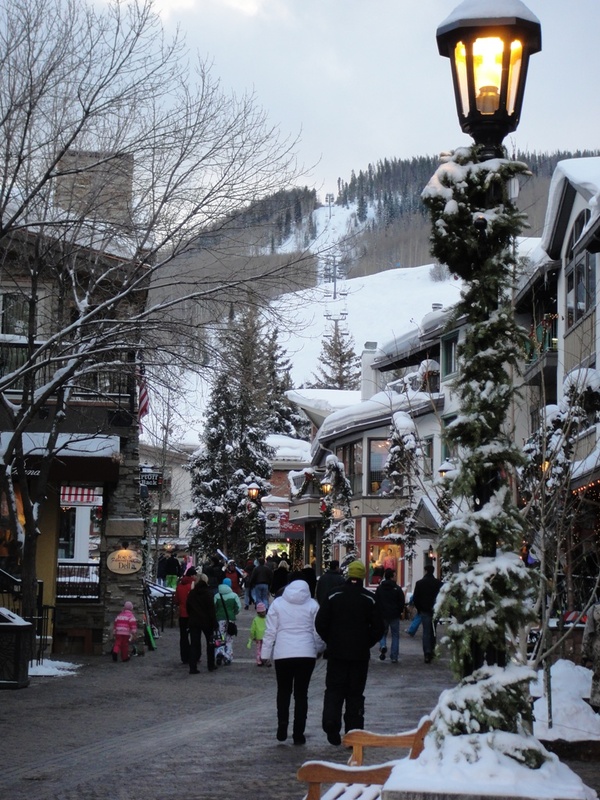 An evening stroll in Vail Village. Instead of ski school the following morning, we kept our daughters with us to see what they’d learned at Keystone. We coasted down the longest green run in Colorado and then met up with a free mountain tour that is provided daily for Vail guests. The volunteer guide shared inside information about how to navigate the vast mountain and find the shortest lift lines, so we stuck with him for several runs. After deftly visiting all corners of the mountain in just under three hours, we stopped for a mountaintop lunch and then spent the rest of the afternoon gliding through fire roads, zipping across advanced runs and offering words of encouragement to our budding ski-bunnies. 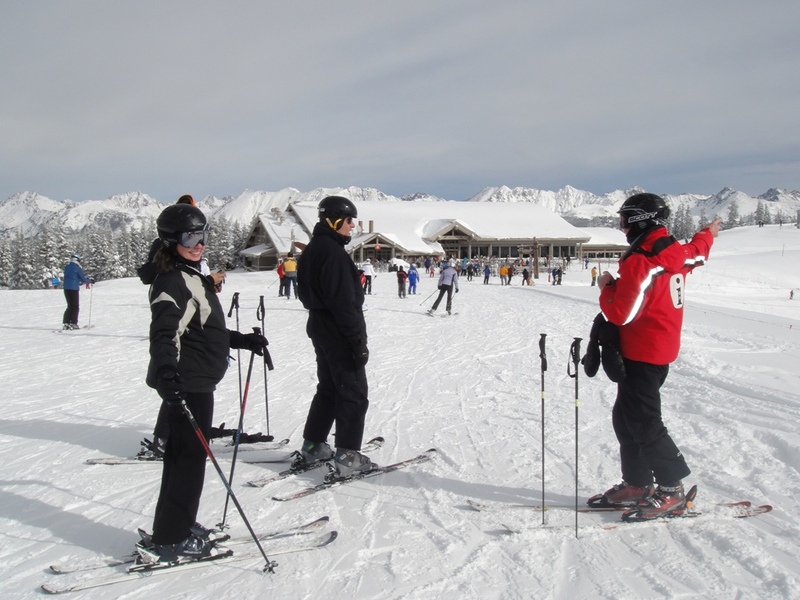 A volunteer guide gives tips to Vail Mountain visitors. Our après-ski cocoa and cookies were well deserved by the time we left the mountain. Slightly rejuvenated, we headed out to soak our aching limbs in a snow-ringed hot tub where delicious hints of wood-smoke drifted in the air. My squealing daughters ripped steamy toes through snow banks, grabbed giant icicles and leaped into the heated pool, where they anxiously watched to see which one would melt first. I stayed relaxing in the hot bath and listened to their gleeful splashing outside my envelope of quiet steam. 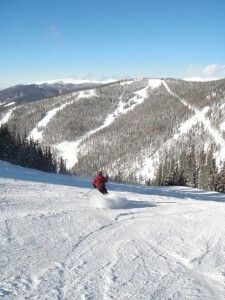 Where to Stay – Red Hawk condos are a short walk from River Run Village and the River Run gondola to Keystone’s Adventure Point, but there are many other condos and townhomes available with equally expedient access to the mountain (www.keystoneresort.com). The Lodge at Vail’s (www.lodgeatvail.com) close proximity to the Vista Bahn chairlift and Vail Village shops makes it an easy home base at Vail. Breakfast Treat – Inxpot Coffee Shop (www.inxpot.com) in Keystone’s River Run Village fuels skiers up for a high-energy day. dessert for less than $10. Where to Play – Keystone’s Kidtopia (www.keystonekidtopia.com) offers Disco Tubing, a colossal snow fort, and family activities for weekend visitors. 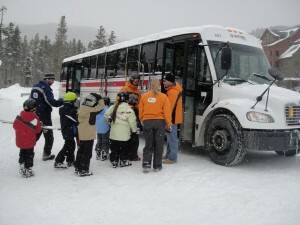 Adventure Ridge (www.adventureridge.com) atop Vail Mountain’s Eagle Bahn gondola is the place to arrange snow biking, children’s snowmobiling and multi-chute snow tubing. How to Unwind – The Keystone Lodge & Spa (www.keystoneresort.com) is a 10,000-foot spa that recognizes the importance of environmental awareness. All treatments are done with organic products, and an effort is made to use organic and recycled products elsewhere in the spa when available.